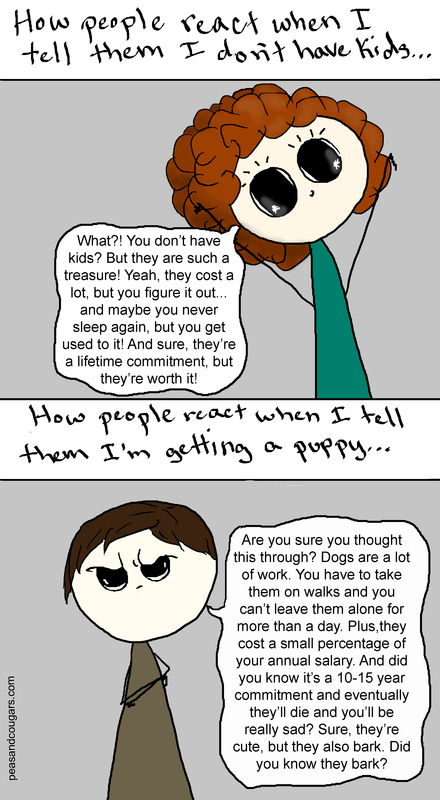 And the same people who tell me to have a baby, try and convince me I’m not “ready” for a puppy. I don’t quite get it. UPDATE: You can see pictures of our puppy here! This entry was posted in Human Interactions, Puppies and Dogs and tagged baby, cartoon, cost, humor, puppy, work. Bookmark the permalink. I respect your opinion but babies are waaaaay cuter. I like to think I’m not biased and that there are equally both ugly puppies and ugly babies. Top reason – puppies are snuggly and they don’t cry. I do think I’d like to have a baby eventually, but damn, it’s sooo expensive in the Bay Area! Yeah, has no-one ever thought of the poor kids you’d impose yourself on as a mother. And they can’t return you and ask for another one either! People are funny that way. What ever you choose to do it will be work, it will cost money, and the bottom line is, it will be worth it! (I love babies and puppies) At least when the puppy decides to destroy the house you can kennel it. You can’t kennel a child for destroying your house. As the owner of a 2 1/2 year old and the father of a 1 year I old I’d say this can really go either way. My dog Orion is still super high energy and enjoys activities including eating from the litter box and trying to sterilize me with well-aimed wags of his tail. My son Logan is also super high energy and enjoys activities including trying to eat the cats and dog and trying to sterilize me with well-aimed headbutts. They are both really bad kissers but they’re both excellent wingmen (which isn’t as helpful as it sounds since I’m married). It is really easy to get someone to watch the kid but really difficult to get someone to watch the dog. But the dog requires slightly less attention and can poop outside while the kid needs someone to play with and poops his pants. Basically, what I am trying to say is, get more cats. But I don’t really mean that. It is pretty fulfilling having both: I feel less guilty when those Sarah McLaughlin commercials come on late at night and I feel like I’m helping to combat the fact that stupid people procreate way more than smart people. Your life will be better with either choice. That first paragraph is brilliant! Haha! It’s true, for everyone I know who has trouble picking up the ladies I’m just like, get a dog! Hahaha that’s hilarious and yet very very true. Everyone is super eager to see a baby inside of you but questions your ability to care for a canine. Been there, still no kids and the dog is alive. Get that puppy! It really is the strangest thing! But yes, I got the puppy and she’s amazing (and a handful, but I knew she would be). She’s a cattle dog mix (we think shar pei because her siblings have more wrinkles and she has some extra skin). I’ll see if I can add a picture! Aw, yes please do! Sounds adorable. Yup my fur children are PLENTY currently. This is me standing up and applauding. All my life I have wanted a puppy for all the reasons you mention above I was never “allowed” to have one. Yet, my life is a tragedy because I didn’t have any kids. Hey, it’s not too late to get one! Yes, I am aware of the fundamental differences between the kids and dogs, but seriously, you don’t live in my house and deal with their shenanigans….so check yourself. They really do have a lot of similarities, except puppies are cheaper and you can at least leave them alone for a few hours. Toddlers… not so much. I am the opposite kind of parent. I love love love being a mom, but this gig is not for everyone. And I don’t know why it would be, because what else is? Everyone, go live the life you find fulfilling. The disconnect between thinking seriously about having a baby responsibly and having a puppy responsibly is crazy. If we encouraged kids/young adults to think as seriously to have a baby and people do on having puppy, there would probably be a lot less unprepared parents out there. And not that that means you should *never* have kids (I’m still thinking I’ll have one one day), but that hitting puberty doesn’t just magically make you ready (unless you count science as magic, then maybe). In our case, the dog was much more of an impulse than a child. We had talked about getting a dog when we lived somewhere that would let us (for example, in a house rather than in a no-pets apartment), but went back and forth on the issue. Then Wicket walked up to Mr. Sandwich at the corner store and put her paw on his shoe, and we had a dog (after a couple of weeks of trying to find her owner and legally adopting her at the county shelter when no one came for her). Puppies are cuter & easier. Those people want you to be a part of their nightmare so they are not alone. Hilarious! I have never thought about it like that, but now I can’t stop thinking about all the people I know who would do the same thing. Awesome!